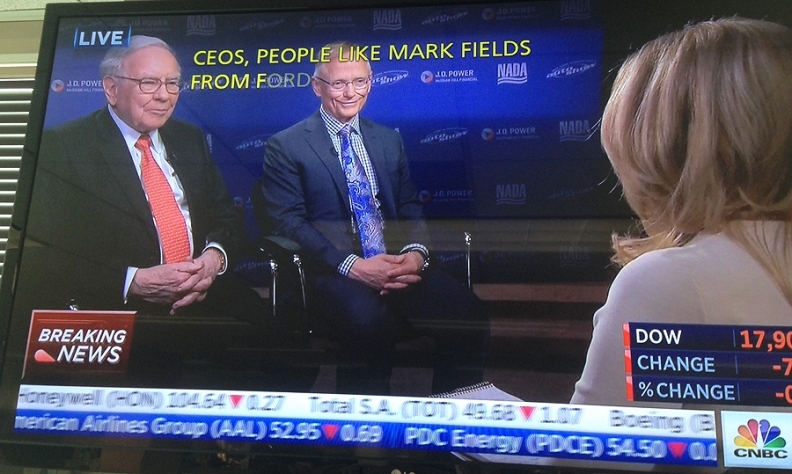 Warren Buffett and Larry Van Tuyl discussed their future acquisition strategy on CNBC today. Berkshire Hathaway Automotive already is on the prowl to acquire more dealerships. And, top executives hinted today, that might include looking outside the U.S.
Berkshire Hathaway Inc. closed on its purchase of Van Tuyl Group on March 9, renaming it Berkshire Hathaway Automotive. Its chairman, Larry Van Tuyl, and Berkshire Hathaway Inc. CEO Warren Buffett spoke today on CNBC’s “Power Lunch.” Van Tuyl said the company is interested in buying dealerships “in the U.S. primarily,” leaving open the option for some foreign investments. The company wants to buy the real estate, too, where available, he added. Berkshire Hathaway Automotive already has grown since the acquisition deal was announced in October. At that time, Van Tuyl Group had 78 dealerships. Berkshire Hathaway Automotive now has 81. Berkshire Hathaway Inc.’s purchase of Van Tuyl Group was the largest dealership acquisition in industry history. Before the purchase by Berkshire Hathaway, Van Tuyl ranked No. 4 on the Automotive News list of the top 150 dealership groups based in the U.S., with new light-vehicle retail sales of 139,538 in 2014. It has more than $9 billion in annual revenue, the company says. Buffett said the automakers have been receptive to him as an owner. Van Tuyl added that the company, founded by his father, Cecil Van Tuyl, has “never been turned down for a deal by a manufacturer.” Automakers effectively have veto power over any acquisition of a franchised dealership by another company. “We look forward to doing a lot of business with Ford and a lot of business with GM and a lot of business with some other people,” Buffett said. Buffett said one of the challenges to growth could be manufacturers’ capping the number of one brand’s dealerships that a company can own. But, he said, good dealership performance is the key to winning manufacturer approval and new store points.